Lubricate the splines with light engine oil. a. To assist in holding the end plates against the blower housing, thread four 5/16-18 in. X 1-7/8 in. long bolts through each end plate into the blower housing. left hand helix rotor 1 in. from each end in the center (refer to column and position CC). assembly section of this work package to install the gears. e. After determining the required amount of shims needed, remove the gears. spacers (Figure 19, Item 3). 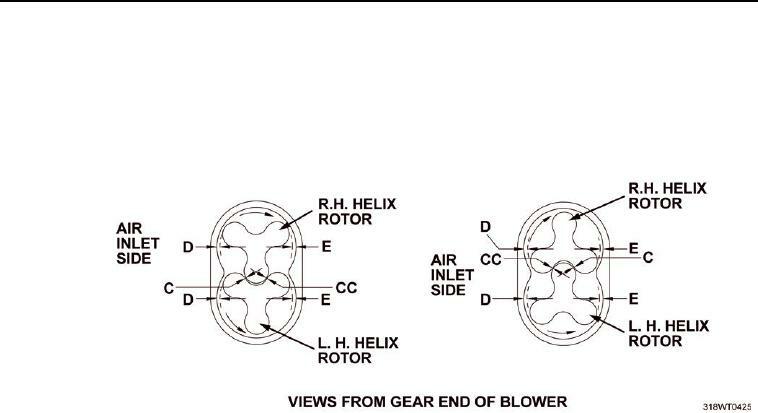 h. Check the clearances between the rotor lobes.